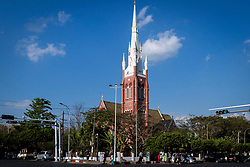 Holy Trinity Cathedral is the primary Anglican cathedral in Myanmar (Burma), located on Bogyoke Aung San Road (next to Bogyoke Aung San Market) in Latha Township, Yangon. The cathedral was designed by Robert Chisholm, a Madras-based architect, in the Indo-Saracenic style to adapt to warm and humid conditions. Construction began in 1886, with the laying of the foundation stone by Lord Dufferin, the Viceroy of India, and was completed in 1894. The pipe organ was destroyed during the Second World War and could not be restored so an electric substitute organ was installed. The stained glass windows were repaired in 2003. The cathedral is listed on the Yangon City Heritage List.